The Victorian Peeper: What Have You Done for Me Philately? As you (my American readers) fork over $8.20 for a double-sided book of 20 "Forever" stamps next month, spare a thought for Sir Rowland Hill, Victorian reformer and inventor of the prepaid postage stamp and the modern postal service. Shown here is the "Penny Black," the world's first postage stamp, which debuted in May 1840. Before the introduction of stamps, postage was based on weight and distance; it had to be calculated for each letter and was usually paid by the recipient. 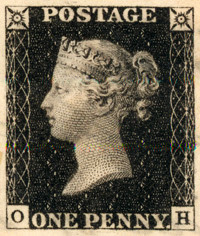 The introduction of the Penny Black shifted the cost of postage to the sender and replaced a system based on complex computation with one based on a uniform, affordable rate. In 1965, Brighton businessman Reginald M. Phillips donated his extensive collection of Victorian stamps to the nation. Last autumn, with support from the Heritage Lottery Fund, the British Postal Museum and Archive digitized the 45-volume collection and made it available on the web under the auspices of a project called "The Penny Black Changed the World." Microsoft has a research initiative called "The Penny Black project" that is looking into ways to reduce e-mail spam by making the sender pay. "Internet e-mail is becoming increasingly expensive for message recipients," say the Microsoft researchers. "In the current case, the culprit is spam. Although spam does not constitute a monetary expense for most users, it does require time and attention (and hence productivity) to deal with spam. Moreover, measurable costs associated with spam are incurred by providers of network services, and these costs are increasing daily." In a nutshell, the idea is this: "If I don't know you, and you want to send me mail, then you must prove to me that you have expended a certain amount of effort, just for me and just for this message." The researchers have investigated several techniques to reduce spam by making the sender pay. Whatever the mechanism eventually adopted, the Penny Black project, with its nod to Victorian philately, gets my stamp of approval. The Penny Black was such a simple and elegant solution. Unfortunately, the UK's Royal Mail doesn't seem to realise that and recently replaced the years-old, weight-based stamp tarriff system with one nobody understands based on a combination of weight and shape.